Photo courtesy of the Vancouver Sun. Published online in the Vancouver Sun on October 7, 2010. 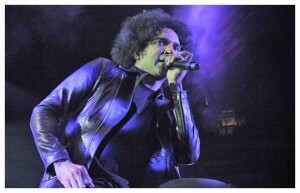 Don’t start mourning the classic Alice In Chains lineup quite yet. Some fans may be quick to pine for the days of Layne Staley, who headed the high-profile Seattle-based grunge band before overdosing in 2002. But after reinventing itself in 2005 with a brand-new lead singer by the name of William DuVall, Alice In Chains are intent on burning a fresh trail behind them as they hand-deliver their sludgy, solipsistic grunge metal to fans new and old. Atlanta-based band Mastodon and Sacramento rockers the Deftones opened the show Thursday night at Rogers Arena to a sea of mostly male fans wearing scrappy metal t-shirts from their high school days that never made the garage sale pile. This was written by Amanda Ash. Posted on Thursday, October 7, 2010, at 7:56 PM. Filed under Articles. Tagged Alice In Chains, Vancouver Sun. Bookmark the permalink. Follow comments here with the RSS feed. Post a comment or leave a trackback.